This listing is for a PDF file only, not an item, not a kit! This tutorial includes a cover page and 10 full pages of detailed step-by-step instructions, photos, patterns and tips for making a dandelion seed head and its leaves, in paper quilling technique. Standard quilling strips, a sheet of green cardstock or pastel paper, a sheet of parchment paper, a sheet of cardstock for background. Quilling tool, scissors, craft knife, cutting mat or any appropriate surface, glue. This PDF tutorial is ©2017 Inna Dorman. It may not be shared or reproduced in any way. All rights are reserved by Inna Dorman. This is a PDF file which will be available for download upon purchase through Etsy. No refunds due to the nature of this electronic product. Absolutely stunning. This A+++ Seller and Artist is one of the best Quillers I have ever seen! Her work can only be described as exquisite and rare. I know I will be a repeat customer. Thank you so much. Thank you so very much, Inna! Although I accept PayPal only, you can use your credit card as well. To pay with a credit card, you need to proceed to paying with PayPal all the way during checkout until you see the PayPal log-in page. At the bottom of the page you will see “Don't have a PayPal account? Use your credit card or bank account (where available). Continue”. Click on “Continue”, you will be presented with a form for credit card payments hosted by PayPal. Please convo me if you are still having problems paying with credit card. Please be aware that I do not ship until the payment is cleared. You may change your mind if the item has not been shipped yet. I will fully refund you in this case. If not paid for a purchased item within 2 days, I cancel the transaction and re-list the item. Please note that buyers are responsible for any and all duties and customs charges that may apply. I do all my best to create special and pleasing works of art, and hope that you love your new Etsy purchase. But if you do not for some reason, please contact me and send the item back within four (4) business days from the moment you receive it. I will issue a full refund for the purchase, but you will pay return shipping. If the item you received is damaged, please notify me as soon as possible and I resolve the problem to your satisfaction. It will help a lot if you can send me photos of the damage with your notification. FRAMING: If you do not want the frame that comes with a framed picture, please contact me before placing the order. I will reduce the price of the item and the shipping costs, and refund you accordingly via PayPal. However, I would not recommend purchasing a frame separately, since I thoroughly choose and often modify frames to match every individual piece (deepen the frame, hand-paint the mat, gild edges, etc.) Please be aware also that handling delicate paper filigree is not an easy task. This is the reason why I offer frames with my artworks by default. 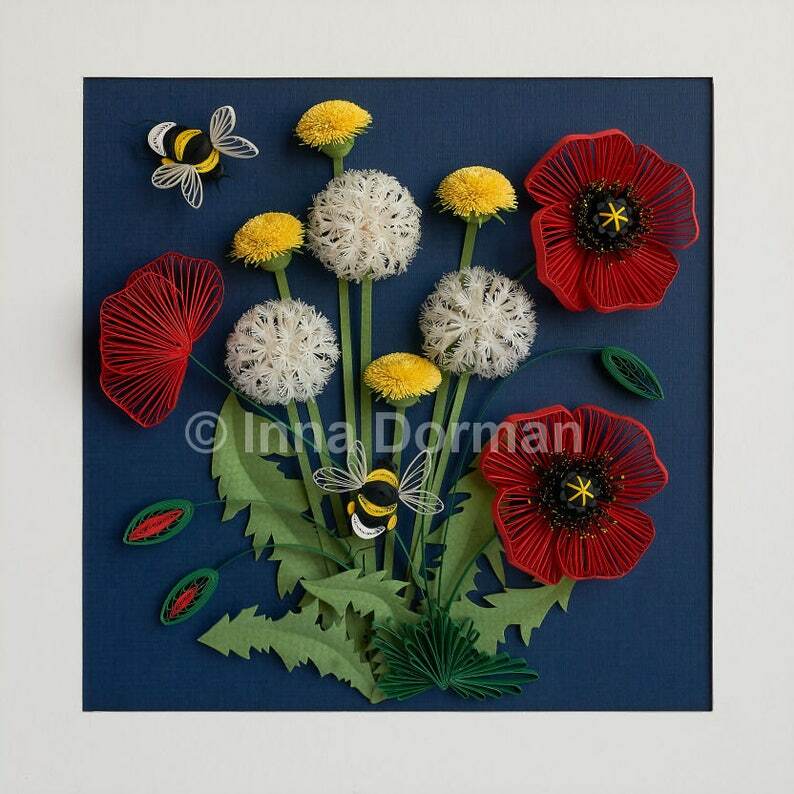 I use IKEA shadowbox frames, which are particularly suitable for paper quilling and are available for a reasonable price. They have real glass for front protection and PH-neutral mats that do not discolor the picture.